Since this year marks the 20th anniversary of Harry Potter, my children's keen interest in this series was renewed. Their choice for every family movie night has been a Harry Potter movie for the past few months. It wasn't a surprise when they brought up the wand we purchased as a birthday gift for my daughter's classmate last fall at King Richard's Faire. They started to get excited about perhaps choosing wands for their souvenirs at our visit to the Faire this year. When they started fashioning magic wands out of paper and using up all the rolls of tape in the house, it was clear that waiting a few months for their wands would be extremely difficult for them. Being the avid online shopper that I am, I started looking on Etsy to see what was available and for what price. I was surprised at the wide range of magic wands (and prices) on Etsy. 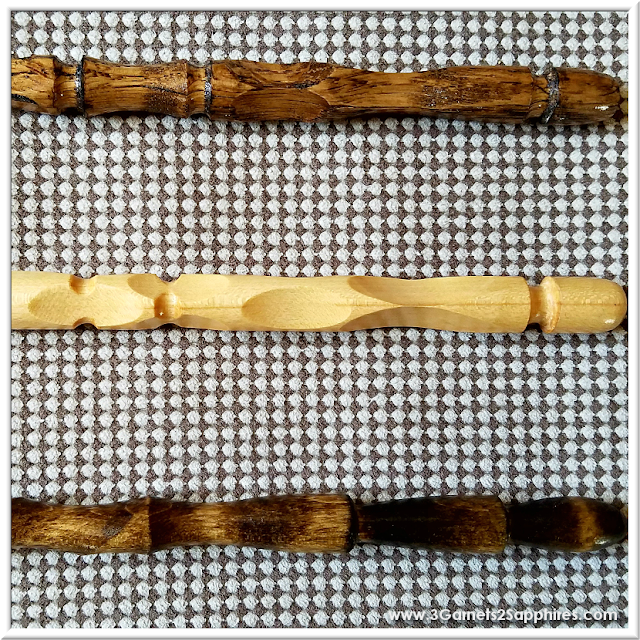 The more I looked, the more I came to realize that I wanted only hand carved wooden wands for my children, similar to the ones sold by the artisan at the Renaissance Faire. When I came upon the shop, OrchardWorks, I knew I was getting close! Here's where the magic happened. I discovered that OrchardWorks offers 'random wands' at an incredible price! You can tell the shop owners what your color preferences are, along with some adjectives that would describe your perfect wand's personality. Then the wand chooses the wizard! You'll see which wand chooses you when it arrives at your door. How cool is that? I have to admit that my daughter was a little worried about not being able to choose her wand herself since she is so particular about everything (no idea who she got that from), but she was extremely pleased with her wand, as were her two brothers. Hers is the light-colored one in the center. Her preferences were that her wand be honey color and delicate. My oldest received the wand at the top. He had asked that his wand be dark-stained and regal. My youngest son's wand is pictured at the bottom, and is my favorite. He asked for a black, twisted, powerful wand. All three have been casting imaginary spells on each other since that day. TIP: If you are shopping for more than one child, you can tell the shop owners the name or age/gender of your children. They'll label each wand for you, so you'll know which wand chose which wizard. 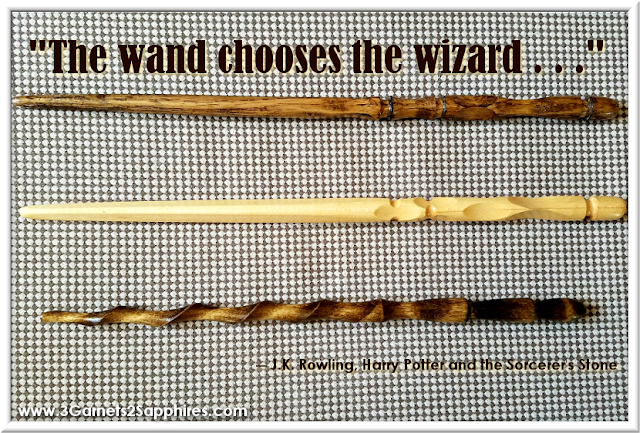 Since I was so impressed by the workmanship and quality of these wands, I just had to share. You would care for them as you would care for fine wood furniture. These would make perfect gifts or even party favors for a Harry Potter-themed birthday party. I wish I had purchased one for myself! Who do you know who would love their own Harry Potter-inspired wand? Share with us in a comment here.